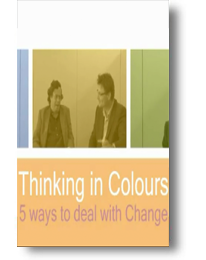 Léon de Caluwé and Hans Vermaak present briefly five fundamentally different ways of thinking about change. Each of these represents a different belief system and conviction about how change works, the kind of interventions that are effective, how to change people, etc. They are labeled by color: yellow, blue, red, green, and white print thinking. Their color-model is based on their observations of current practices and existing theories about change. The model is used to deal more effectively with change. It assists choosing the most viable change strategy for a specific issue. It also helps diagnose issues from different angles, which enables a better understanding. It is used by change agents to reflect on their own assumptions, competences and credibility. Most importantly, it supplies a common language between people involved in a change effort to do all this more consciously and collectively. Underneath are seven small video’s, starting with an introduction, then outlining each of the colors and ending with applications. The ‘colors of change’ which are described in more detail in the handbook ‘Learning to Change’ as well as in articles, tests, etcetera. If you like to know more, look at those publications on this site.